Since I think it’s super helpful to have some of this information in English. I’m posting the translated version of a few pages to this page. Note that the text here is as-translated by my browser (for now), so there are mistakes — lots of ’em. Some of them are even pretty funny. Helpful tip, the word zote in Spanish can be translated to English to mean dim, stupid, or dunce. So when you see “dunce” in the translation, below, assume it means Zote. I’m leaving all the dunces there for now just because. Where ZOTE was typed in all-caps, the translation left the word ZOTE in tact. I doubt anybody actually named Zote “stupid” so I’m going to assume they meant “simple.” It is a simple, basic, true soap. But who knows. I’ll try to do some research. Hopefully you get the gist of the translations. If you have any questions just ask. I’ll do my best to answer. I still like Zote soap and find it in stores here in the Washington DC area. In fact, I find it in even more stores than when I wrote my original Bar Fight: Laundry Bar Soap post. BE A SOAP FOR HIGH QUALITY MAY BE USED WITH CONFIDENCE IN THE WHOLE FAMILY CLOTHING. It is recommended to wash clothes people sensitive skin being of natural origin . ZOTE is a soap pure Laundry, unburdened made based on coconut oil and beef tallow, containing optical brighteners, whose shape and size are ideal for hand washing. In the past, in rural areas of Mexico, it was common to see women washing their clothes with dunce in rivers, on special boards or rocks, or in bowls in their homes;because since Crown it launched in 1970, it became a favorite of Mexican housewives to remove stubborn stains and wash delicates products. In the beginning, soap ZOTE was manufactured with an almost manual process. Today, we have the most modern equipment and the latest technology for the manufacture of this and all our products; but we retain the original formula that led to ZOTE to be the market leader in Mexico. WHEN EVERY TIME IT IS LESS COMMON PEOPLE Handwash? The basic ingredients of natural origin used in the manufacture of dunce are the same used for toilet soaps; therefore, it is not abrasive ingredients that make ZOTEideal for washing delicate items that may be damaged in the washing machine (as sweaters, woven clothing and underwear), preserving them in good condition product and extending the life of the same. For this feature, many used to wash the clothes of people with sensitive skin or baby clothes. Notwithstanding the foregoing, has great cleansing properties, making it ideal for prewash collars and cuffs of shirts and to remove stubborn stains. Another of the distinctive features of ZOTE is her perfume: the essential oil of citronella plant has a pleasant smell like lemon; Thanks to this ingredient, clothes washed with ZOTE retains a fresh and pleasant smell for several days. The main raw materials are tallow and coconut oil, they are neutralized with caustic soda to the saponification process, contains salt (sodium chloride), glycerol, bleach fragrance optical and dye, in the case of ZOTE pink and ZOTE blue. optical brightener soap ZOTE contains an optical whitening bleach discolor clothes without clothes. Optical brighteners are compounds that provide brilliance to clothing, giving a visible blue color to the garment washed; his work is seen in white clothes. WHAT TO DO IF SWALLOWED If swallowed (which is very difficult to be solid) can cause nausea or vomiting. It has no toxicity problems. WHAT TO DO IN CASE OF EYE CONTACT In case of contact with eyes should be rinsed with plenty of water. You can wash your clothes in the sink or laundry to adjust. Thoroughly wet the garment and scrub it with soap dunce until foaming. Rinse with plenty of water until the soap is gone. If desired, you can add softener Carisma . Hang up and let dry as it does regularly. In case of woven garments it is recommended to dry on a flat surface on a towel. Carve your laundry with dunce before putting it in the washing machine, for prewash collars, cuffs and stubborn stains, ensuring superior cleaning. • In a bowl with hot water of more than 2 liters, let soak a bar of soap ZOTE 200 g overnight. In the morning you can use the solution water with soap for hand washing or washing machine. bring to boil on the stove, stir occasionally until a thick solution. REMOVING TOUGH STAINS without chlorine Apply the soap mixture ZOTE boiled still hot and dry directly on the stain of the garment. Put the garment in the sun until the soap hardens and pull it off; the stain will be attached to it. The remaining solution may be used at other times, following the same procedure. Add the grated soap like dunce of any presentation to the washer from the start of the wash cycle with detergent. Upon normal wash cycles, you will realize that there will be more control foam and your clothes are whiter. To peel, you use a common knife or a cheese grater. Add a piece of soap ZOTE inside a sock or cloth bag sealed, put it in the washing machine in the last wash cycle and rinse. YOUR TOWELS WILL BE GENTLE. SURPRISING IS THE AMOUNT OF APPLICATIONS THAT GIVE THE SOAP dunce . Can I bathe with dunce? I got on the scale this morning because I do that from time to time. The scale said that I’d lost 10 pounds. I did a double take. I little spark of joy popped up from somewhere in my middle. I mean, I’ve been trying to watch what I eat and get more exercise. But recently I’d been holding steady except for a pound here and there. I swear just last week, I weighed 10 pounds more. My stomach was a little touchy yesterday, so maybe it made a difference. And I haven’t been keeping as well hydrated! So maybe I only lost some water weight. That’s when I noticed my pants on the floor next to the scale. Only not just next-to but also partly under one corner of the scale. The scale was a tiny bit crooked and cushioned by my pants. I’d accidentally overlapped a bit when I slid the scale out to use it. I moved my pants. I gained nine pounds back. So I lost a total of one pound. Yay? Dave heard me complain from the bathroom and said, “towel rack, Dad.” Recalling an episode of the Simpsons where Homer is weighing himself and part of his belly was propped on the towel rack giving him a false reading on his bathroom scale. Along with classic iced tea and sweet tea, I especially love a good peach tea. 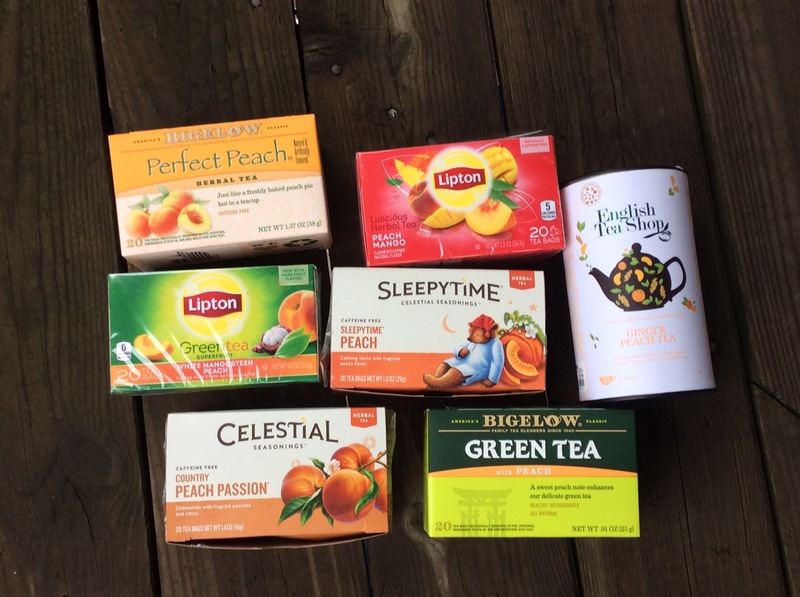 So began a search for a great peach tea that I could make at home. There are three major roads to peach tea. 1. Scratch recipe with real tea and fruit. 2. Peach-flavored tea leaves in tea bags or loose. 3. Instant, peach tea powder or liquid drops. 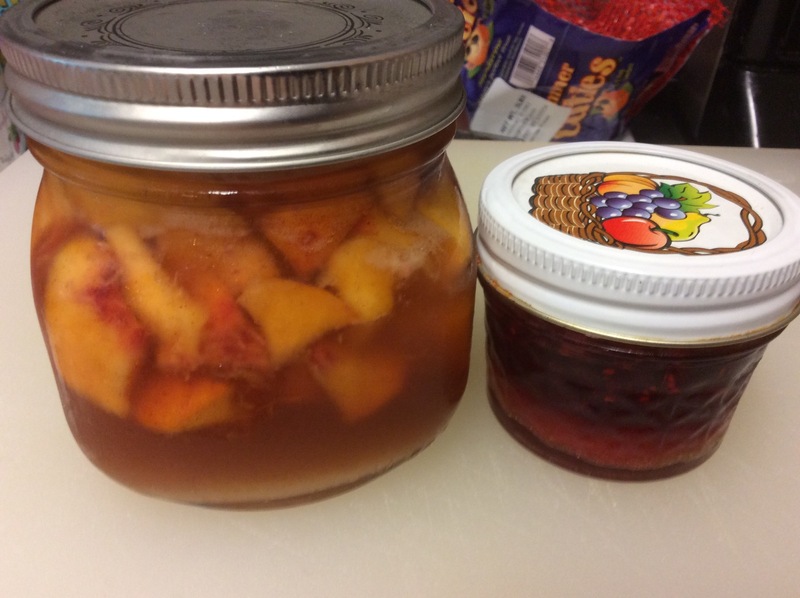 Today’s blog covers peach tea from scratch. There are still some excellent peaches to be found. Get ’em while you can! 1.) Make 2 cups of iced tea concentrate. My process is here. Let the tea cool some while you work on the peaches. 2.) Peaches! Start with 3 cups of cut up juicy ripe peaches. (Cut out any bruises.) This is a great way to use up super ripe peaches. 3.) Finely chop peaches in a food processor or blender. 5.) Strain the blended peaches. If you like it pulpy, use a mesh strainer with larger holes. If you hate chunks and pulpy bits, then use a fine mesh strainer or a even strain a second time through a coffee filter (it will drip through slowly though). The leftover peach pulp can be used for frozen ice pops or peach purée in baked goods or peachy apple sauce, etc. 6.) Add the nectar (juices) to tea that has cooled some. 7.) Sweetener or sugar can be added to bring out the sweetness of the peaches. Start with about a tablespoon or two of sugar. Adjust to your liking. Mix in the sugar before you put the tea in the fridge so it can dissolve well. You can also use a non-sugar sweetener, but keep in mind the peaches add a lot of sweetness on their own. So taste as you go. 8.) Keep your fresh peach tea in the fridge. Serve over ice. Yum. I make what I call Zombie* Peaches anyway and this makes it easy and quick to make real peach iced tea. This yields about 2-1/4 cups of peach tea (not including ice). 3.) Pour the tea over ice. Zombie Peaches already have sugar dissolved in them, so you don’t need to add more. But you can adjust to your liking by adding extra sweetener. If you add extra sugar, add it before the ice. The beauty of Zombie Peach Iced Tea is that it is usually fairly clear and not cloudy like blended peaches. Zombie Peaches last for weeks in the fridge so it’s easy to make ahead of time and whip up a glass of peach iced tea when you like. This same process can be used with other fruit like raspberries and strawberries. *I know the name “Zombie Peaches” may not sound very appealing. When I originally named them, had been thinking “zombie” because the fruit seems like it should be dead but it lives on and on. Zombie, right? Plus my daughter had a zombie ranger summer camp that she loved! So we had zombies on the brain. But zombies get pretty yucky looking. Vampires, on the other hand, stay relatively youthful and well preserved. And this is about preservation. So maybe I should call it Vampire Peaches? Both zombies and vampires are forms of the undead, right? Humm. Maybe I’ll post an updated recipe with a new name. I know it’s not Tuesday. I almost finished this on Thursday. I thought maybe I could call it Tea for Thirstday. (Get it?) But now it’s Sunday. So … I’m just leaving it Tea for Tuesday. A class reunion in August and trip to visit friends near Nashville, Tenneessee, and later my dad in the Carolinas, reinforced my love for southern cooking and beverages. I visited a Cracker Barrel Old Country Store one too many times. I drank a lot of iced tea all summer long. Iced tea is almost as favorite a beverage as its hot counterpart. I may not like sweet tea as syrupy as some (blame my Northern / Midwestern origins), but I love a good iced tea with the right balance of astringency, flavor, and sweetness. This Labor Day weekend is a good time to drink even more! Iced tea is natural and real brewed tea even has health benefits. It can be very economical. Plus you can control the sweetness when you make it yourself! Not all tea is created equal — true for hot and iced. The tea matters! There’s a specific flavor I want. Fortunately, you don’t have to spend a lot of money. Lipton and Luzianne both give a lot of the flavor I’m looking for. I’m sure I could make excellent iced tea using expensive, loose-leaf tea. But for me, nostalgia rules where iced tea is concerned. Why spend the extra money? That said, I like several variations on iced tea — peach tea, strawberry tea, hibiscus tea, and half & half tea aka an “Arnold Palmer” (1/2 tea, 1/2 lemonade). All can be yummy. I’ll save those for another post. For classic iced tea I use Family Size tea bags. It takes a lot of tea to make really good iced tea. One puny, single-serving tea bag will tint your water brown, but not much else (unless you want a really small glass of iced tea). 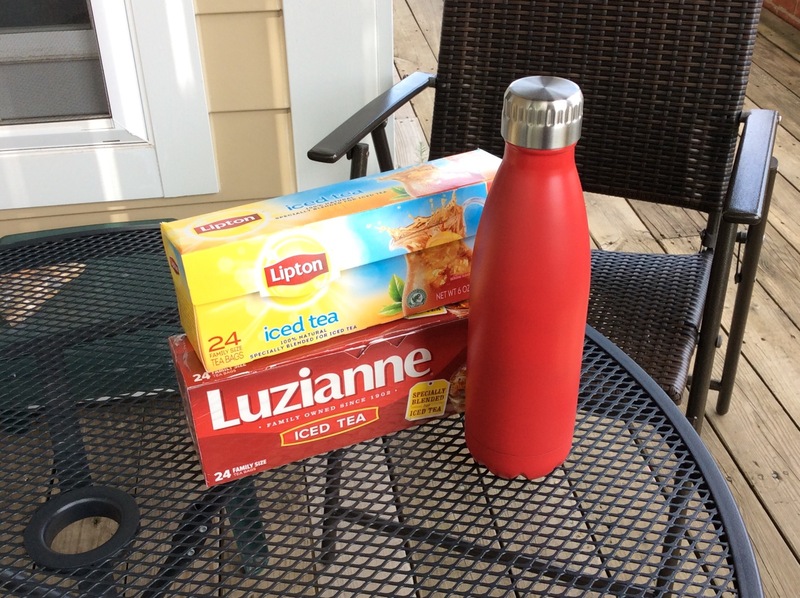 Directions on both Lipton and Luzianne are similar. I don’t change much at the beginning. 2.) Add 1 Family Size tea bag. So here’s where I mix things up. Luzianne’s instructions say to add an additional 2 cups of cold water and then chill (ya know, just relax a little). Lipton’s iced tea instructions start with 4 cups of water and 2 Family Size tea bags, but the ratio of water to tea bags is the same as Luzianne’s. Then Lipton says you should stir in 6 cups of ice cubes (or 4 cups cold water) and refrigerate. What? Water down my tea on purpose? I personally don’t add extra water or ice to the tea until I’m ready to drink it. I let the tea concentrate cool some on the counter before refrigerating, or I just pour the concentrate over ice in my glass (some ice will melt). Even better than a glass, I often use an insulated stainless steel bottle with ice. It will stay cold for many hours and not “sweat” (no condensation on the outside). (I have too many stainless steel bottles. That’s another story.) Most of my stainless steel water bottles hold about 17 ounces, so I get a full bottle plus extra with 2 cups of tea concentrate plus ice. It’s easy to add water later if you find the tea to be too strong. Adjust as needed. It’s not easy to make tea stronger if it gets too watered down. Plus if you keep the tea in the refrigerator, adding more water just takes up more space in the fridge. So just make the tea concentrate and be happy! And chill. I usually like iced tea with a little squirt of lemon. Sometimes I add it, sometimes I don’t. I also like it sweetened. Individual sweeteners may vary. It’s practically impossible to dissolve sugar in ice-cold tea (it takes a very long time). So add any sugar while the tea is still very hot. About 1 to 2 tablespoons of sugar for each cup of tea seems to be standard for sweet tea. But use more or less to taste. Stir well. Or make a simple syrup to add to the tea later. Simple syrup is just a lot of sugar dissolved in boiling water. Make sure it’s still a liquid when it cools (not hard candy). I don’t always want real sugar in my tea. I know. In the south, I’m probably considered a heathen. But sugar is bad for my teeth and not great for my waistline either. I already eat too much of it. So what do I like? I like a mixture of sweeteners. The following amounts are based on about a 14 ounce serving of tea concentrate served over ice (ice that will partly dissolve). Some of the water comes out with the tea bags, so it’s not a full 16 ounces any more. If I’m going sugar free, then I like 2 packets of Stevia in the Raw plus 1 packet of sucralose (like Splenda). Stevia on its own tastes a little too weird to me. The sucralose seems to even out the taste nicely without adding too much weirdness of its own. Plus this way it’s mostly natural. Just 1/3 mystery ingredient! Both dissolve fairly easily even in cold tea. If I’m going to go a little wild (I know how to live it up, don’t I? ), then I like Truvia Baking blend. It’s a mixture of sugar and Stevia. Since it has sugar, it’s best to add this while the tea is still hot. The flavor is close to real sugar, thanks to the, you know, real sugar. I’ve also mixed this combo with sucralose for a good sweet tea flavor that has very little sugar. That would be 1 teaspoon of Truvia Baking blend plus 1 packet of sucralose. Using Truvia alone, I’d go with 2 teaspoons. Adjust to taste. Try some variations yourself and see what you like best. Enjoy and have a cool Labor Day weekend!